Nick Zwart: Windows tablet will save education in virtual worlds? Windows tablet will save education in virtual worlds? Last november I spoke at the the first National Congres on Education in Virtual Worlds in Tilburg (NL) about what the future might bring. And tablets was one of these hot future items. Lots of schools are using (or planning to use) tablets, most of them use iPad at the moment. But on an iPad it is not really possible to work with virtual worlds like OpenSim and Second Life. The only solution I found for iPad is 'SL Go', which allows you to log on a server that connects to the virtual world, creates the graphics for you and sends the stream to your tablet, for only 10 $ per month (only available in the USA at the moment), but it does not run voice chat yet. 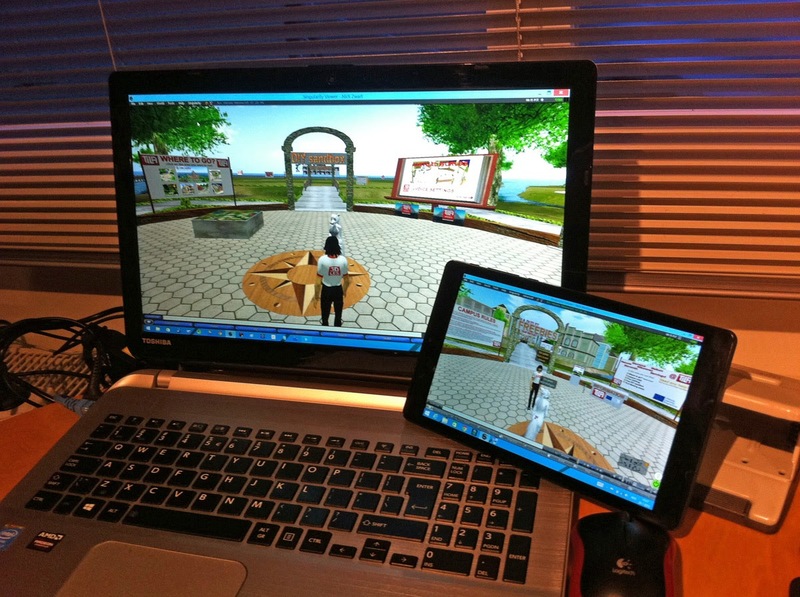 With the new Windows 8 tablets and '2 in 1' systems a whole new world opens for working in virtual worlds. Now we can have a full Windows tablet running our favorite software to enter OpenSim or Second Life. With even the audio and voice chat working. Starting at € 300 we see brands like: Asus, Acer, Dell, Medion, HP, Sony, Lenovo, Samsung and even Microsoft in the higher range with their Surface Pro series. These tablets offer full Windows so you can work with all your favorite software tha you used for all these years but now on a tablet, including the software to enter OpenSim and Second Life! So I did a little test and bought myself a cheap Windows tablet (Archos 80 Cesium - 8" screen) at the local drugstore in our village for 125 Euros ($145), and installed the Singularity viewer on it. After logging in at the 3DLES grid I found everything working fine. It loaded all the graphics fast, navigation works well with the on-screen navigation arrows (a bit small on a 8" screen) and even voice chat works fine. Just wear a headphone and use the microphone in the tablet. So I tested it some more to see if I could also do some video conferencing using Big Blue Button, which also worked fine. The webcam at the front does the work. The only thing that is not really great is shortage of memory. 16 Gb is not really enough to have a great running tablet and the 8 inch is actually a bit too small, but it is a start. So anyone who wants to use a Windows tablet for OpenSim of Second Life, go for the 10 inch with at least 32 Gb memory. Want to see some more about this item? Short video of the National Congres Education in VW at Fontys Tilburg (NL), click here. Video of Søndermarkskolen, Denmark that used Dell tablets for a 3D project on the 3DLES demogrid, click here.